The Cirque that will put a smile on your face… or else. My children of the night, my players of misfortune, play in my carnival of melancholy madness. Straight from the farthest reaches of the world – I give you the best oddities you will find anywhere. 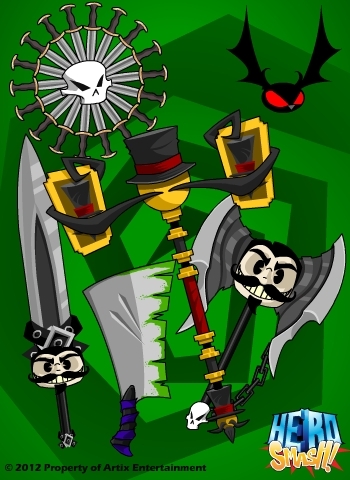 This event includes 3 new items which will go totally rare and NEVER return once the Cirque du Muerte leaves town: Twisted armor, Teddy Cutskin axe, and the MonkeyBack item! We have the Carnivorous Clowns of Killdarro. Do you have what it takes to defeat them all, and still keep all your limbs? Test your might against the Alligator Man of Alldinguo. Labor laws state that I must feed him every day, but between you and me, I don’t, and boy is he hungry! Will you be his next meal? Enjoy my Cirque of Insanity. I brings my finest Armors, Weapons, and Items to all those daring enough to wield my wicked wares. Let us play with your fears. Play while you can my pets, my Cirque du Muerte won’t last for long. Jemini, Thyton, Dumoose, Randor the Red, Polistar, and Ichidori are my heroes this week. They made some AMAZING items, armors. Dumoose gets a big hug - as well as Llusion for doing the magic that they do an the maps to make them special. Play on everyone. Enjoy our very first Friday the 13th event. It's the only one this year too. Greeting power people! Time is ticking down and I thought I would give you a sneak peek at what is planned for our HeroSmash Friday the 13th release. 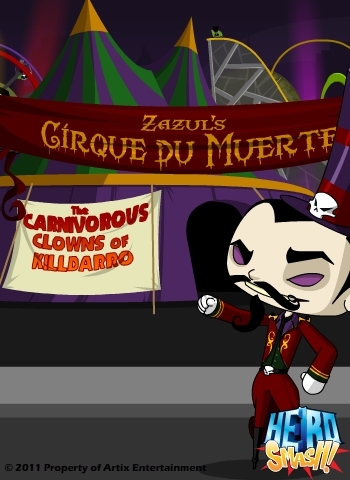 I give you Zazul and his Cirque du Muerte! On the night of Thursday the 12th an eerie fog forms around Celebration Fair. When the people of Super City awake, there is Zazul and his creepy carnival of freaks and shrieks. 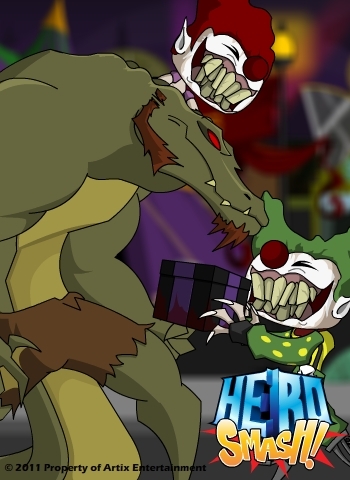 Will you have what it takes to outlast the Carnivorous Clowns of Killdarro? Are you strong enough to take on the Alligator Man of Alldinguo? Zazul will be selling his finest carnival weapons and armors for all those who are brave enough. 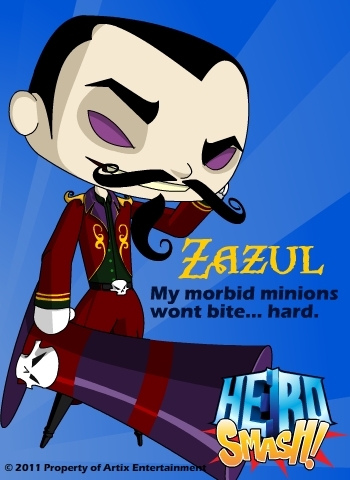 Zazul and his morbid minions will be blowing in this Friday, but they won’t be there for long, and there is only one this year.